Welcome to Ken Shaw Toyota, your certified Toyota dealership in Toronto, Ontario. 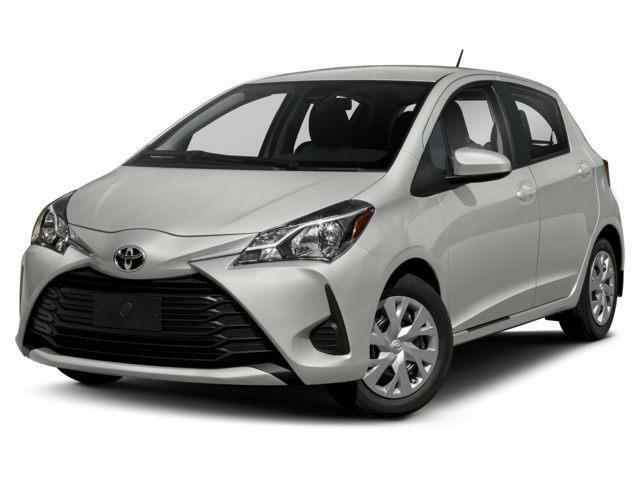 We are presenting the new 2018 Toyota Yaris Hatchback. You can find all the relevant information below. Enjoy! Jack be nimble, Jack be quick – but even Jack can’t hold a candle to the 2018 Toyota Yaris Hatchback. Jump in, and enjoy the Yaris Hatchback’s European driving dynamics, zippy 1.5L four-cylinder engine, and responsive electric power steering. Choose your transmission – a 5-speed manual or 4-speed automatic with overdrive – and know that the Yaris Hatchback puts the fun into every road trip. Its subcompact footprint means Yaris Hatchback is fuel efficient and easy to park, while still capable of holding five adults. And with fresh style for 2018 – inside and out – the Yaris Hatchback looks good, too. All models sport updated front and rear fascia styling, plus new wheel designs. All models feature revised interior trim. Comfort is improved on all models with heated front seats as standard. Safety is enhanced on all models with a backup camera and Hill-start Assist Control as standard. Show off your modern, urban style. With the Yaris Hatchback’s updated design, it’s the subcompact that’s making everyone take a second look. New wheel designs firmly plant the Yaris Hatchback on the pavement, while its subcompact form means it’s no problem to navigate even the narrowest of downtown laneways. Inside, the Yaris Hatchback is surprisingly spacious, with room for five adults or more than 430 L of cargo. New trim detailing enhances the cabin’s style, while drivers will enjoy the ergonomic layout of instrumentation and controls. Interior features standard on all models include heated front seats, a multi-information display, ECO Indicator (on automatic transmission models), power windows and door locks, a sporty three-spoke steering wheel on tilting column with steering wheel-mounted controls for the audio system, plenty of thoughtful in-cabin storage, digital clock, and more. 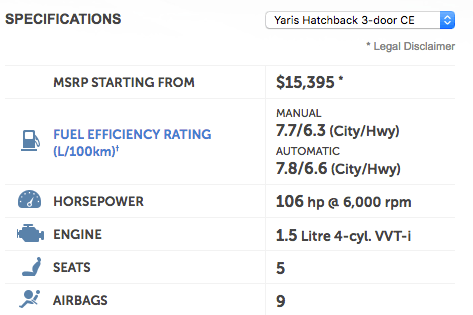 Every Yaris Hatchback also features a long list of active and passive safety systems as standard on all models. This is headlined by Toyota Safety Sense C – a bundle of advanced safety systems including the Pre-Collision System… Lane Departure Alert… and Automatic High Beams. Other features include the six active technologies of the Toyota Star Safety System, nine standard airbags, and – new for 2018 – a backup camera and Hill-start Assist Control on all models. 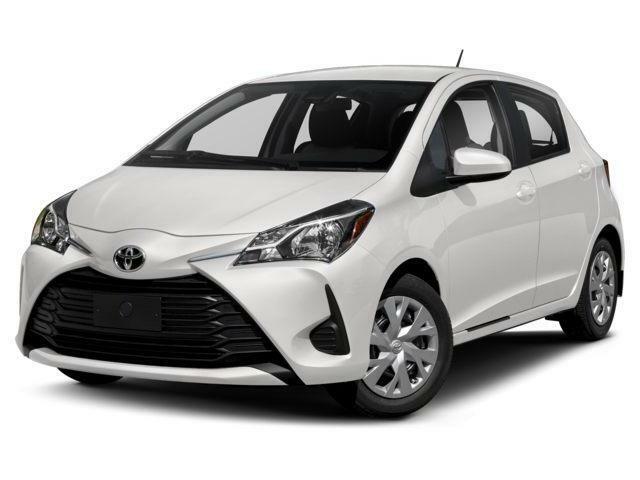 The 2018 Toyota Yaris Hatchback 3-Door CE (Starting MSRP: $15,390 standard; $16,370 automatic) features a 6.1” Display Audio System with Bluetooth connectivity and four speakers, a passenger side rear walk-in assist, newly designed 15” steel wheels, front and rear splash guards, a rear window wiper/washer, and more. The 2018 Toyota Yaris Hatchback 5-Door LE (Starting MSRP: $16,700 standard; $17,700 automatic) features a 6.1” Display Audio System with Bluetooth connectivity and four speakers, air conditioning, keyless entry, cruise control, child protector rear door locks, power adjustable and heated exterior mirrors, newly designed 15” steel wheels, front and rear splash guards, a rear window wiper/washer, and more. 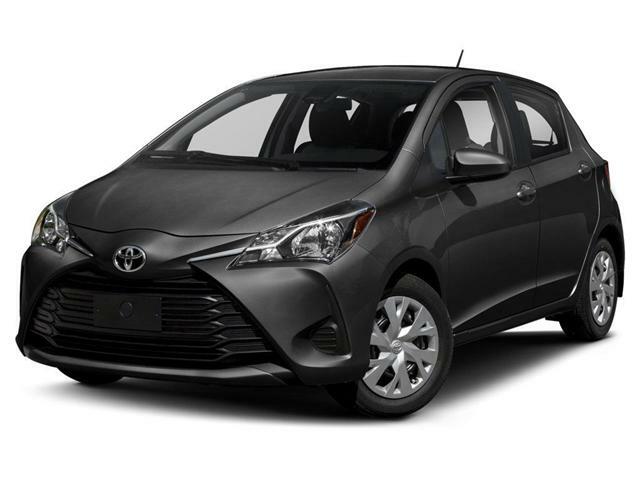 The 2018 Toyota Yaris Hatchback 5-Door SE (Starting MSRP: $18,350 standard; $19,350 automatic) features a 6.1” Display Audio System with Bluetooth connectivity, integrated Sirius XM Satellite Radio, and six speakers, air conditioning, special sport fabric seat material, a leather-wrapped steering wheel and shift knob, keyless entry, cruise control, child protector rear door locks, power adjustable and heated exterior mirrors, newly designed 16” aluminum alloy wheels with locks, a rear spoiler, projector-style halogen headlamps, fog lamps, LED daytime running lights, and more.